It has been refreshing to see all of the Titans back at MWC this year — Samsung, LG, and Sony proudly presented their own top-tier phones for the first half of 2019 and competition is surely stiff. Especially among Samsung and LG, the battle has been going on for quite a while. Admittedly, Samsung has been winning in recent years, with LG taking a few wrong steps and generally not having marketing campaigns as tremendous as Samsung's, but the company is still here and still innovating. 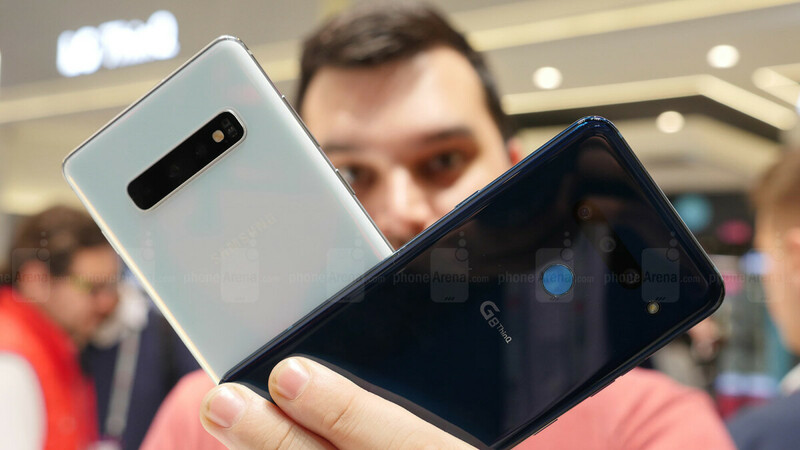 Both the Galaxy S10 and G8 ThinQ are the logical continuation of their predecessors. With hardware upgrades, some facelifts around the design, and some quirky new features, they are both pretty good 2019 flagship phones. But the question is — which one impressed you more? Let us know in the poll below! I don't think either stole the show. However they both had good devices for different reasons. I love Samsung's foldable smartphone, then I saw Huawei's, and said wow. However both have terrible prices, and both concern me in regards to durability, especially the Huawei foldable. The screen is always exposed on that device. Now going back to the bread and butter devices like the S10+, S10, and S10e they have a lot of nice things about them. I like the under the screen ultrasonic finger print sensor. I love the base configurations on these devices, like the 6gb of ram and 128gb of expandable storage. Which is double what Apple offers for it base devices. LG G8, and V50 both come with the same base ram and storage as the S10 devices. Plus these devices come with screen speakers, or the screen is the speaker. They also have 32 bit audio dac on board. But the part I am most interested in is the time of flight cameras these devices come with. You can use air gestures above the cameras with your hands to navigate the UI (without touching the display), and you can scan objects to generate a full 3D point map, which can be used AR, VR, or 3D printable objects. That is really cool tech. I also like how LG made a screen case for their new smartphones that double it's screen. But I don't see myself buying that extra screen case. The S10 and S10+ both have 8GB ram in their base configuration. Only the S10E has 6GB ram. The LG air gestures currently work very poorly. At least some sites report this. Not even the LG staff could unlock the G8 reasonably by hand (after the event at the test devices). At least LG still has a few months to fix this. "You can use air gestures above the cameras with your hands to navigate the UI (without touching the display)," Sorry but waving your hand above a phone as though you are a Jedi just makes you look like a bit of a tw@t. It's just a bit of a useless gimmick. Damn, I'm an LG fan, but Samsung really impressed me. LG G8 for me, no ugly Samsung with hole and ugly back design! Right, cause you're always looking at the back of your phone. Hahaha. Is this an actual question? Samsung stole the show and now....steal the poll! Personally none were that impressive to be honest, but the Samsung S10 was a little more impressive. Tbh Samsung stole the show by default cause the G8 is just so bad. "computer screen tough guy" All he did was voice an opinion about a piece of gadget, it's not like he was threatening or bullying someone with his comment. Chill. Dude went a lil overboard with that post bro. Sony and Nokia did. For one we knew almost everything about the S10 family for months now. At least the G8 had some surprises. None actually. They were both boring to the death tbh.. However, the Galaxy fold is an entirely different animal in all honesty. I hated it when it came out and hated it more when the leak of the Huawei mate X was leaked. But after actually seeing them both in full presentation, videos and carefully scrutinizing them, I have to say the Galaxy fold wipes anything and everything out the water. It is more thoughtfully created and crafted and every single thing was done by design. Infact if it has an S-pen it would be pretty much be game over till the next iteration. I would even go ahead to say that the G fold is the most premium looking and by a large margin tbh.. Yes the screen at the front is small, yes, it's thick, yes it is expensive (but was were you expecting for new technology ffs, lmao) but that thing is an absolute jewelry in terms of form and a monster in terms of machine. The G fold should be the clear winner this year. Infact, I dont see anything getting close to it (except Motorola release the razr) till the next G fold. Yes good points. The foldables were much better than I thought. But those prices are scary.lol But they look nice for first generation devices. I'm an LG fan - (haven't used a Samsung Android a day in my life since 2011 when I switched from the iPhone) and even I had to vote for the S10. A fairer comparison would've been the V50 to the S10 and the S10 still would've won. LG phones have great audio hardware, but that's pretty much it. They don't get "cool" things like reverse wireless charging or a beautiful and modern new UI (you have to pay someone like Mark Bencze $1.75 on the Play Store to fix that). Even then - a V50 is really a V40 which is really a notched V35 that is a V30 with slight incrimental upgrades - all of which doesn't feel very new if you already owned one of the previous models in the first place. So smoke on them apples LG, perhaps a huge battery and a fresh modern (dark) UI would help your buzz appeal. I just want to know who has best quality Ultra Wide Angle Camera? G8? S10?